(Newser) – ObamaCare's most dangerous critic right now "isn't John Boehner or Mitch McConnell or even Ted Cruz. It's Jon Stewart," argues Chris Cillizza at the Washington Post. Stewart dedicated three full segments on Monday night's show to mocking ObamaCare's ugly web debut, and put the screws to Kathleen Sebelius earlier this month about the individual mandate. "Who cares what a late night comedian/talk show host thinks? 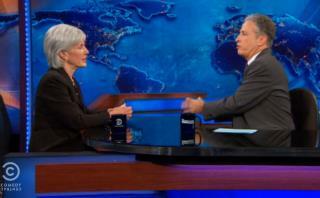 President Obama should if viewership details on Stewart's show are right." Next on Newser: Climate Change Victim: McDonald's Dollar Menu? Jon Stewart is trouble for ObamaCare for one reason and one reason only: Stewart is telling the truth about it. Anyone offending Obama about spending the 12 Trillion, I would like to ask you, where did the money go? Democrats didn't take it, welfare people didn't get millionaire's, so where in the world the money went? Did Wonka took care of that?